Looking to lay the groundwork for her presidency if she wins the White House in November, Democratic candidate Hillary Clinton named several veterans of President Barack Hussein Obama’s administration for her transition team. Ken Salazar, a former interior secretary and U.S. Senator from Colorado, will lead a team of four co-chairs including one-time national security adviser Tom Donilon and Neera Tanden, a former Obama aide who now leads the progressive Center for American Progress think-tank, the Clinton campaign said. The other co-chairs are former Michigan Governor Jennifer Granholm and Maggie Williams, director of Harvard’s Institute of Politics, the campaign said in a statement. The announcement came as Clinton has gained momentum in the opinion polls against Republican rival Donald Trump, whose campaign has struggled after he made a string of controversial remarks since formally winning his party’s nomination last month. Clinton leads Trump in the Nov. 8 presidential election by more than 5 percentage points in a Reuters/Ipsos tracking poll released on Friday. The current RealClearPolitics average of polls shows her 6.7 points ahead. Clinton has been a former secretary of state, U.S. senator and first lady and her transition team includes old names from her long tenure in Washington, some of whom have also served Obama. Tanden, who played a key role in shaping Obama’s health care overhaul, is a longtime friend and adviser to Clinton who worked on her Senate campaign. Williams was the 1992 transition director for Clinton when she became first lady, and then her chief of staff in the White House when Bill Clinton was president. Two policy advisers on the campaign, Ed Meier and Ann O’Leary, will also move full time to the transition team. Heather Boushey, the executive director of the Washington Center for Equitable Growth, will be the chief economist, the campaign said in a statement. Boushey has advised the campaign on economic policy. Transition teams oversee personnel appointments and help develop an administrative framework during the period between the November election and the inauguration in January, to make it easier for a new president to begin implementing policy agendas. Trump, a New York businessman who has never held elected office, picked New Jersey Governor Chris Christie to head his own transition team in May. Trump drew heavy criticism after engaging in a prolonged spat with the parents of a Muslim U.S. Army captain killed in Iraq. Last week, he suggested gun rights activists could take action against Clinton, a statement critics found alarming but which he later said was aimed at rallying votes against her. Trump also called Obama and Clinton the “co-founders” of Islamic State, a false claim he later said was sarcastic but did not wholly abandon. Is this the video ad that will finish her? It does not take a prophet to predict that Hillary will do irreparable harm. That likely hood is well supported by a shipload of scandals, criminal acts and an endless trail of lies. No sane person believes that she will automatically reverse course and be a decent competent president. Hillary will destroy America with stunning finality. For anyone pining to see the demise of America…Hillary is the ideal next step. She is Obama 3.0…and something worse. How she is worse is seen in a simple comparison. Obama is a malice-driven ideologue. His passion is to dismantle the United States. His hate for America, Christianity and Israel informs every policy. Hillary is not an ideologue. There are no code, any manifesto or core beliefs with this one. She lusts for power. She will say and do anything in order to hold on to power. Even her marital martyrdom to a serial adulterer is all for show to keep her in the game. If she is elected president there are 4 things that will happen. There is no maybe in this—these 4 things are guaranteed to take place. Economic collapse: She will continue secular progressive bloodletting. She will increase addiction to government handouts. We are nearing $20 trillion in debt. Under her influence we will reach economic critical mass: a debt we can never pay off. America’s standard of living will never recover. Moral nuclear winter: Islam and immorality will enjoy widespread appeal as despair overtakes the nation. The rights of Churches, Christian hospitals and colleges will be wiped out. Free speech will evaporate. Believers will be unable to move up in corporations or will be fired for their faith. She will also abandon Israel with the same heartless ease that she abandoned the Americans in Benghazi. Violence and death will overtake our children: Discard morals—throw God out—honor debauchery and you will turn entire urban areas into killing fields. The disregard that Obama engendered toward police will become outright rejection of law and order under Hillary. Crimes will not be reported. Guns will be confiscated leaving the average citizen utterly helpless. She will also import criminals and terrorists. Obama opened the borders—she will open the floodgates. The cops will be hog-tied and violent offenders will avoid prosecution. We will lose our Constitution: Hillary has already boasted that she will exceed Barack Obama’s use of executive orders. She will add justices to the Supreme Court that favor her mission to sidestep the constitution of the United States when it interferes with her ambitions. She has repeatedly said that she wants to rewrite parts of the Constitution. For the third consecutive week, ratings for the National Football League (NFL) have plummeted, as players continue anti-American protests during the playing of the national anthem. For the third consecutive week, ratings for the National Football League (NFL) have plummeted, as players continue anti-American protests during the playing of the national anthem. This week’s drop-off also coincided with the Monday broadcast of the first presidential debate between Republican nominee Donald Trump and Democrat nominee Hillary Clinton. NFL viewership continues its rocky start to ’16; “MNF” hit hard by the presidential debate. Monday Night Football performed even worse. Monday’s game between the Atlanta Falcons and the New Orleans Saints received a low 5.7 rating, a 38 percent plunge from week three of last year. Notably, the game was competing against the first presidential debate between Trump and Clinton, an event that earned the biggest debate audience in U.S. political history.According to CNN Money, the September 26 debate brought in more than 80 million viewers. 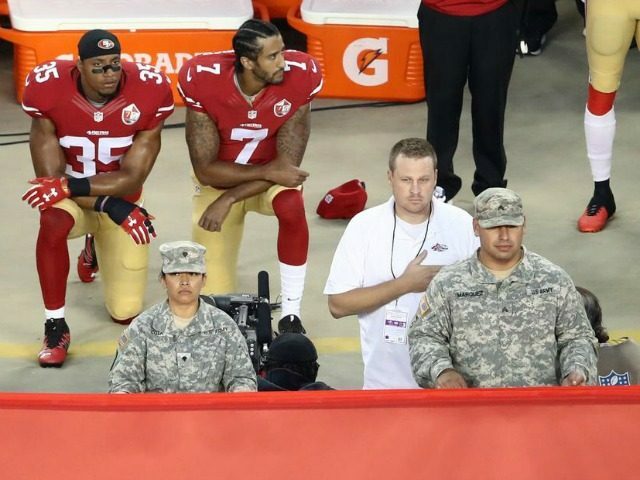 But the NFL has also been suffering under the anti-American protests during the playing of the national anthem, which San Francisco 49ers second string quarterback Colin Kaepernick started three weeks ago. Since Kaepernick decided to sit out the anthem instead of standing at attention as everyone else was doing, a host of other players across the NFL have joined him in his attack on the United States. Some have decided to emulate Kaepernick’s action of staying seated during the anthem. Others took up his secondary protest of kneeling in the field during the song. Still others have taken to raising the militant black power fist in the air during the anthem. Not content with his on-field protests, Kaepernick has continued his anti-American rants off the field. Recently, as a rejoinder to GOP nominee Donald Trump, he said the United States was never great. Since his first attempt to criticize the country, Kaepernick’s anti-American protest has spread to other sports, including high school and college athletics. Walmart is apologizing for refusing to make a police officer’s retirement cake last week after an employee told the cop’s daughter that her “thin blue line” cake design might be considered racist. The police officer’s daughter, who has remained anonymous, told radio host Todd Starnesthat she went to a Walmart in McDonough, Georgia on Thursday to ask for a cake with the American flag in black and white with a blue stripe added in. But one of the employees at the bakery balked at the common police officer emblem, telling the woman “the design could be perceived as racist and nobody feels comfortable decorating the cake,” she recounted to Starnes. When she asked for a simpler cake, with just one blue line on a chocolate background, the employee said she didn’t “feel comfortable” with that design either. “I asked her, ‘Is there something wrong with cops?’” the woman recalled, according to Starnes. The employee again refused to make the cake. Taylor Wilkes, a Georgia police officer and family friend, originally posted about the cake incident on Facebook early Friday morning, criticizing the store for their “appalling” behavior. The police officer’s daughter eventually went to Kroger to have the cake made, according to Wilkes. After the post went viral, the Walmart manager met with the daughter again to apologize, Wilkes wrote Saturday. The manager offered a gift card, additional items for the party and to make the cake that the daughter had requested. But Wilkes said the gesture appeared to be a response to public pressure rather than true atonement. “So, although the mistake was ‘made right,’ I will still not be shopping at Walmart due to the ‘quality’ of employees they hire,” Wilkes added. Starnes shared a photo of the cake, which showed a thick and lumpy blue line of frosting surrounded by the words “Blue Lives Matter” in white, off-center text. Ted Cruz: Why I am voting for Trump. Why You should too.